Happy Easter you lovely lot! I hope you've had the best 4 day weekend ever and have eaten so so much chocolate. I've had the best time chilling with my family and celebrating my dad's birthday. When it comes to any kind of social gathering with my family, it always revolves around food. Always. Luckily this time round I was excused from the kitchen, my only task was to sort out the bun and cheese (literally slicing cheese and buttering bun) so I put my feet up and enjoyed all the eating. A few weeks back though I did have a lil throw around in the kitchen and put together something that was so delicious it was crazy to me that I'd never made it for dessert before. 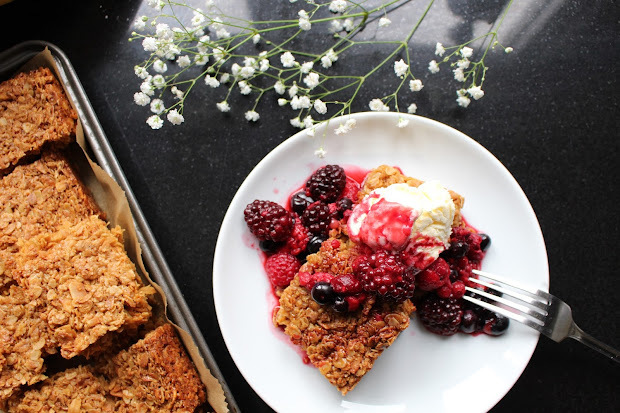 Basically, it's warm flapjacks with berries and ice cream. So flipping good and so flipping simples. I got the base ingredients from BBC Good Food and then added in a few ingredients. 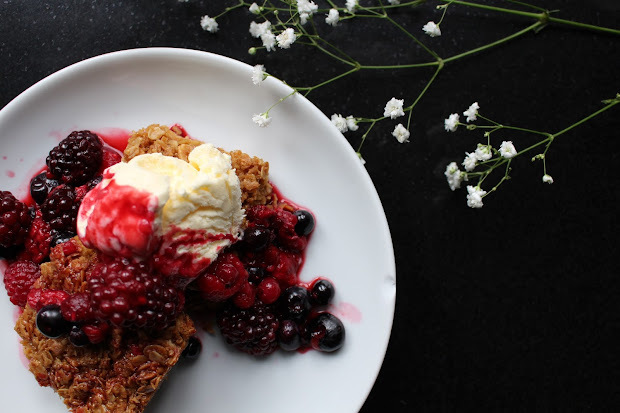 I warmed up the berries when the flapjacks were a couple minutes off being ready and then served them hot from the oven (well , like 5 minutes cooling time so that you don't burn fingers or mouths) and then added a dollop of clotted ice cream. Also the best part is that left overs make an awesome snack the next day! Win.